A delicious Italian entree that's nice and light while still leaving you feeling satisfied. 1. Preheat a charcoal grill to medium-high heat. Move the coals to the side so that one part of the grill has indirect heat. 2. In a small bowl stir together the olive oil, parsley, lemon zest and salt. Set aside. 1. In a separate small bowl, mix together the salt, oregano and red pepper flakes. 2. Lay the chicken cutlets flat on a cutting board, lengthwise, and season all sides with the salt mixture. Place a piece of prosciutto on each cutlet. Fold each piece of provolone in half and place on top of the prosciutto. Follow with 1 sundried tomato. 3. Working one at a time, roll the chicken up, in a continuous spiral roll, and seal by sticking 2 parallel skewers through the roll. Proceed with the remaining chicken, sticking 2 rolls on each pair of skewers for easy flipping. Drizzle the chicken with the olive oil and grill starting directly over the coals. Sear the chicken on all sides flipping as needed, until golden brown, about 10 minutes. Move the skewers to indirect heat and continue to cook until cooked through, about an additional 10 minutes or. Remove from the grill and allow to rest for 5 minutes. 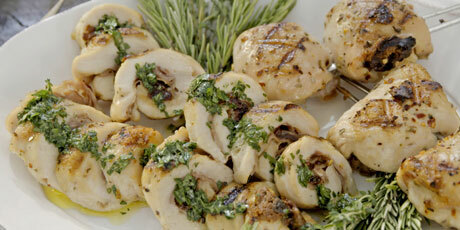 Remove the skewers from the involtini, slice and serve, drizzled with the parsley oil.